BURNS, OR -- The Oregon nature preserve being occupied by an armed anti-government group was surrounded by law-enforcement agents Wednesday, a day after one of the occupiers was killed by officers during a traffic stop and eight others, including group leader Ammon Bundy, were arrested. The confrontation came amid increasing calls for authorities to take action against Bundy for the illegal occupation of the Malheur National Wildlife Refuge, which was seized by the group on Jan. 2 in a bid to force the government to turn federal lands over to local officials. Details of the fatal encounter were sparse. It happened as Bundy and his followers were heading to a community meeting late Tuesday afternoon in the town of John Day, about 70 miles north of Burns. It was unclear what led to the shooting, or if Finicum or any of the other ranchers exchanged gunfire with officers. Authorities would not say how many shots were fired. "This is where I'm going to breathe my last breath, whether I'm 90, 95 or 55," Finicum told The Associated Press on Jan. 5. " ... I'm going to not spend my days in a cell." The FBI and Oregon State Police would say only that the dead man was wanted by federal authorities. They said no more information would be released pending formal identification by the medical examiner. At a news conference Wednesday, Harney County Sheriff Dave Ward said he was disappointed that a traffic stop that was supposed to "bring peaceful resolution to this ended badly." "Multiple law enforcement agencies put a lot of work putting together the best tactical plan they could to take these guys down peacefully," Ward said. "It didn't have to happen." The occupation has created stress among area residents, with some occupiers "trying to stir issues" with them. "This has been tearing our community apart. It's time for everybody in this illegal occupation to move on," Ward said. "There doesn't have to be bloodshed in our community." Greg Bretzing, special agent in charge for the FBI in Oregon, noted the armed group was given ample opportunity to leave the refuge peacefully and have their grievances heard through legal means. "They chose, instead, to threaten the very America they profess to love, with violence, intimidation and criminal acts," he said. 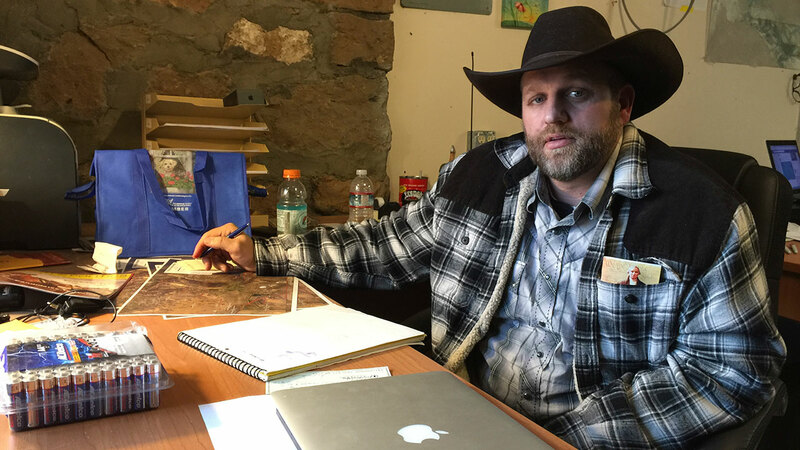 Jason Patrick, one of the leaders of the occupation, told Oregon Public Broadcasting that five or six group members remained inside the refuge. For weeks, law-enforcement vehicles have been noticeably absent from the roads around the refuge. On Wednesday, however, marked law-enforcement cars were parked throughout the region. The FBI and state police said they were setting up checkpoints and only allowing ranchers who own property in specific areas to pass. "If the people on the refuge want to leave, they are free to do so through the checkpoints, where they will be identified," Bretzing said. About 13 miles from the refuge headquarters, a sign warned drivers to turn around because a roadblock is ahead. Reporters and others who approached the vehicles blocking the road were met by FBI agents wearing camouflage body armor and helmets and carrying assault rifles. A spike strip, designed to puncture tires, was laid across the pavement just beyond the roadblock. Police and news media have converged on the nearby town of Burns, where most hotels are booked to capacity. Brand Thornton, one of Bundy's supporters, said he left the refuge Monday and was not sure what those remaining would do. "The entire leadership is gone," he told the AP in a telephone interview. "I wouldn't blame any of them for leaving." In addition to Ammon Bundy, those arrested were: his brother Ryan Bundy, 43; Brian Cavalier, 44; Shawna Cox, 59; and Ryan Payne, 32 - apprehended during the traffic stop on U.S. Highway 395 Tuesday afternoon. Authorities said two others - Joseph Donald O'Shaughnessy, 45, and Peter Santilli, 50 - were arrested separately in Burns, while FBI agents in Arizona arrested another, Jon Eric Ritzheimer, 32. The group, which has included people from as far away as Michigan, calls itself Citizens for Constitutional Freedom. It came to the frozen high desert of eastern Oregon to decry what it calls onerous federal land restrictions and to object to the prison sentences of two local ranchers convicted of setting fires.